Developed in close collaboration with some of the UK's most well-known companies this pioneering programme offers a unique balance of IT, Management and Business skills to ensure that our graduates have the skills and expertise they need to thrive in the industries of the future. A score of 18 points in three higher level subjects, with no score lower than 5. D3,D3,D3 in three Cambridge Pre-U Principal Subjects. A,A,A at Advanced Highers (or A,A at Advanced Higher and A,A,A at Higher). Successful completion of the WBQ Advanced Skills Challenge Certificate plus 2 GCE A-Levels at grades AAA. Co-created with leading employers such as Accenture, British Airways, IBM, Morgan Stanley and Unilever, the BSc in Information Management for Business (IMB) is designed to respond to the needs of innovative employers, equipping students to respond to the challenges that lie beyond digital business transformation. We aim to provide the highest quality management and technology education - providing deep insights into managerial issues faced by technology-intensive organisations. You will gain an all-round knowledge of computing systems and how information is derived, managed and exploited for commercial benefit. IMB encourages you to develop an entrepreneurial mindset - seeing business challenges as opportunities - whilst linking cutting-edge technology with innovative business practices to create and capture value. 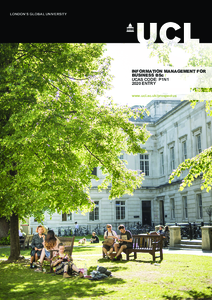 As a UCL School of Management student, you will benefit from a bespoke careers and employer engagement programme. IMB graduates go on to work with leading companies in the UK and internationally. The purpose of the first year is to provide you with the best possible grounding in information technology, leadership and management. This will serve as a foundation for the development of professional skills, knowledge, understanding and expertise throughout the rest of the programme. The second year further develops core knowledge whilst allowing specialisation through the choice of an elective module from a set of pathways options that reflect typical graduate destinations. In this way, you will be able to develop the skills and expertise most appropriate to your career aspirations. Elective pathways continue into the third year through the choice of two additional elective modules. Before the start of the final year you will be expected to identify a specific area for your extended project, which is often undertaken in close collaboration with one or more employers in our network. Project options range from more academically oriented dissertations, through consultancy-based projects to the exploration of new business opportunities in an enterprise project. You will select one elective module from a wide range of pathways. You will select two modules from a wide range of options. Teaching and learning is conducted through lectures, seminars, case studies and practicals and is supported by a substantial and ever-developing virtual learning environment. You will participate in business-focused workshops, industrial guest lectures and scenario-based challenges. Extensive background reading and independent research are required throughout the programme. In order to progress from one year to the next you will need to pass all modules taken. These are examined through coursework and written examinations. Detailed course descriptions are available on the department website: Information Management for Business BSc. The programme will provide you with many skills, including: a solid core in business, project management and team-working; greater depth and breadth in technical capacities; and a foundation in excellent leadership. You will develop the professional, personal and inter-personal skills to enable effective communication at all levels of an organisation. From the first week of your studies our close contacts with employers will provide you with opportunities to work with leading companies. IMB graduates go on to work with leading companies in the UK and internationally. The leadership, professional, technical and personal expertise developed during your degree will provide you with a very broad range of employment and study options when you graduate. We are looking for evidence of your interest in, understanding of and passion for the transformative effects of digital technologies in a business context. This may be demonstrated by paid or voluntary work experience, by examples of relevant project work carried out during your academic studies or through your articulation of the likely impacts of emerging technologies. All successful applicants based in the UK will be invited to attend an offer-holder open day. This will provide an opportunity to find out more about the programme and meet some of the academic staff and current students. Students based outside the UK are assessed on the basis of their UCAS applications. We do encourage you to visit UCL if at all possible.